With the impending demolition of Columbus, Ohio’s failed downtown mall, it is worth taking a moment to reflect on all of the urban planning failures of the past, and all of the things that, while they were successful in a sense, had serious unintended consequences: urban renewal, pedestrian malls, highway mania, single use zoning, federal housing subsidies, etc. It seems to me that almost every urban planning approach du jour ends up, over time, either not accomplishing the things it was touted as delivering, or brought serious negative side effects. Why is this? 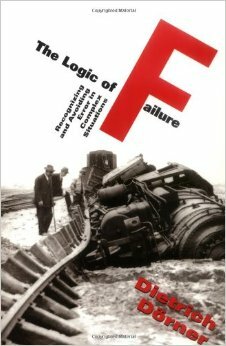 The answer is easily supplied by German cognitive psychologist Dietrich DÃ¶rner’s seminal work, The Logic of Failure, which is an absolute must-read for anyone in any field. The answer, simply, is that humans are extremely poor at decision making in “complex” environments, and fall prey to a series of well-understood decision making traps. The human brain is a marvel. It excels at all manner of tasks. For example, the human brain seems to be extremely good at solving problems involving simple linear cause and effect type relationships. That is, problem of the “if A, then B” variety, or what Jane Jacobs would have called a “two factor” problem. This is easily extensible to multiple variables if they behave in well defined ways. Thus humans are extremely good at things like shooting a basketball through a hoop, designing bridges, determining the orbits of planetary objects, shooting pool, programming computers, balancing a checkbook, following an algorithm, process, or instruction set, or even putting a man on the moon. We also seem to be great at problems that involve pattern matching or processing and analyzing large amounts of sensory input into a sort of gestalt state. Thus we clearly recognize and understand shapes that are incomplete or which are rotated in space, scaled up or down, or deformed. We can also do extremely demanding things like drive a car or fly and airplane with relative ease once we learn a task. Pretty amazing if you think about it. A large number of interdependent variables that affect each other, potentially leading to long chains of inter-related events. Effects act with lags, so the results of an action are not always immediately apparent. Variables that act dynamically, in response to external or internal stimuli, even if we take no action at all. Intransparence – we do not always know all the variables, their values, and how they relate to each other. “Chaotic” behavior, where very small changes in the initial state or seemingly tiny actions can have dramatic consequences downstream. Failure to properly deal with lags. I’ll put this one first since it is arguably no one’s fault. Just look at Washington, DC today. People are debating a stimulus package. Everyone knows that a stimulus acts with a lag. The question is, how much stimulus do you apply and when will you know if it worked or if you need to do something else again? Hard to say. Nevertheless, in a system with lags, we are extremely prone to “oversteer”. We make decisions based on the present situation, without regard to the fact that our previous actions will have the intended effect in a future period. The employment of “methodism” in response to uncertainly. This means that people have a tendency to try strategies that were successful at dealing with something in the past. This can have its uses, but it has a tendency to decay into formula and ritual. Like most of us, planners have an attachment to the tried and true. But that might not be the right strategy. De-contextualization of solutions. I consider this an extension of methodism and one of the most serious problems I see in practice. That is, solutions are proposed or implemented without concern to the context in which they are to be applied. You see this all the time in “school solutions” that people with a particular policy preference are pushing. Deregulation was a good thing in the past, therefore continuous deregulation of the financial services industry was a good thing. Uh, sorry. The classic example is light rail. Light rail was successful in Portland, so light rail advocates propose it in almost every city they come to. But the vast bulk of cities are not Portland. It’s not so much that rail is per se the wrong idea (though sometimes it is). But the simplistic arguments in favor of it rarely have anything to do with the actual city in question. It’s dogma – the recitation of cant. Let’s ask the right questions: what are the facts on the ground in my city? What would a city that had a successful transit system look and function like? What type of solution would be needed to make that happen? What other things would need to be in place? What would we have to do to make it a reality? Is the change we would have to make as a city worth it? This is where government policy can actually have an unintended negative effect. President Obama clearly understands the importance of cities and plans to establish an office on urban policy. It is the nature of government to promote uniform laws and policies – which is a good thing in many contexts. But it would be a disastrous thing from an urban policy perspective because our cities are so diverse. They don’t all need the same thing. They need different things. Even in the Midwest, consider just Chicago, Detroit, and Columbus. What do these cities have in common? Well, some things, but they are radically different places with very different challenges, opportunities, and needs. There can certainly be a role for federal policy and money, but the key is to get it right. This means looking at where common policies and programs are necessary, but also understanding where it is important to devolve decision making and policy setting to the local level. It also means staying engaged with “the field” to understand what things are working or not, and why. Over-emphasis on the present conditions and extrapolating them into the future. Again, we see this all the time. A current trend or fashion arises, and people suddenly assume that is the future. We saw it with the dot com bubble. We saw it with structured finance. One area we see it in spades is globalization. I happen to think globalization is real, is here, and isn’t going away. But, it is going to evolve over time. Almost all responses to globalization assume that the way it is shaping the economy and cities today is the way it is going to do so tomorrow. That may be true, but it may not be. That’s why I advocate that even cities like Chicago which are doing well should be thinking seriously about what the future might hold and what they need to do to get ready for an uncertain future, not just rest on their present success. It’s about where the hockey puck is going. Reductivism. This model of thought attempts to deal with complexity by simplifying the causal mechanisms to one variable. Again, we see this all the time. For example, things like transportation, energy, or climate are often posited as a primal force shaping a city or driving behavior. These are influential and important to be sure, but are they the only things? Repair service behavior. People have a tendency to fix what is broken. That’s also what politics generally demands. But often the serious, catastrophic problems were long present in the system, but no one noticed them until it was too late. “Management by exception” is a valid philosophy, but you’ve also got to pro-actively be probing, questioning, and thinking about where tomorrow’s problems might be before it is too late to do anything about them. We spend all of our focus on the problems of now without considering the future. It’s a about what’s important, not just what is urgent. Solving problems in isolation. When we do see a problems, we tend to view them in isolation and develop problem-specific policies. But most problems are linked in a complex system. It’s like squeezing a balloon. Fixing one problem may exacerbate another. Things like brain gain, immigration, economic development, land use, and transportation aren’t separate problems to be solved separately. Approaches to them have to be part of a holistic approach to the city. Forgetting about what’s right in the world. Again, by nature we focus on what is wrong and what we want to change. We often forget about what we want to keep. I think in general most of us tend to under-value the environment we live in and the way that it actually functions well. To a great extent, well functioning urban systems are invisible. This is where unintended consequences can come and bite you big time. We once saw a problem with crowding and such in the city and wanted people to be able to own a single family home with plenty of space. So we subsidized the heck out of that. But we forgot about the values of the city, and that there was a lot in the city we actually liked. Unfortunately, in the mad rush of suburbanization, we destroyed a lot of that in most places. This should give you a flavor. What are the lessons we can draw from this? I think there are a few. The first is simply to approach urban policy and urban planning with humility and rich understanding of the limits of what we can accomplish. This I think is desperately needed. There are so many policies out there that are promoted with almost messianic zeal by their advocates. It never ceases to amaze me that after all the failures of the past, all the unintended consequences, people are still ready to attempt to radically remake our cities on the basis of fairly simplistic policy approaches. By all means let’s try things, but let’s be cautious too. Along with this I think we need to be very skeptical of dogma and silver bullet solutions. I’m all in favor of looking for the best ideas out there, and think we ought to be looking at places to find out what worked elsewhere. But we also need to have a rich understanding of our own city and our own circumstances to evaluate what is appropriate here, and what we need to do to achieve true and lasting success without all the unintended side effects. A great city, like a great wine, has to express its terroir. How should we cultivate our own unique soil to bring forth that full flowering and unique character? Diversification. Cities can’t put all their eggs in one basket. It is just too risky. We need to cast a wide net and be willing to try lots of things, knowing some will fail. DÃ¶rner talks about efficiency diversity, or having many different possibilities for actions that have a high probability of success. This is exactly what we need. We need to constantly be looking for feedback about how we are doing. Again, let’s try things. But then let’s see if they are working. This is very hard because practically speaking most policies are promoted by people in the context of a political process. This means the leader who promoted it is personally invested in the program and his or her enemies will pounce in the event there is a change of direction or, horror of horrors, an admitting of a mistake. This is where great leadership in a city comes into play. The reality is, a lot of what we do runs the risk of failure, or at least will need tweaking. That’s ok. Most business ideas fail. But without an entrepreneurial culture, our economy eventually will stagnate and die. Failure isn’t necessarily bad, particularly if we are able to fail quickly and cheaply. The best cities are willing to try things, knowing that some won’t work out. But occassionally there will be a home run. And we need to think about the goals we have. The real goals. When our policy is successful, what will the city look like? What is that shared vision of the holistic end state? It’s not about the solution, it’s about the results. This one bears repeating: states and the federal government need to recognize the diverse needs of our cities, and not promote or require one size fits all solutions. This can be hard to do. When you give cities home rule power and money to spend at their discretion, it is inevitable that there are going to be blow-ups. But if we over-compensate by putting our cities in a straitjacket, we do more harm than good in the long run. Lastly, we need to be clearly aware of the fact that with urban policy, we are dealing with a complex, dynamic system. Since people fall into predictable thinking traps, forewarned is forearmed. I believe we can rise above our own human limitations to make dramatic improvements in the quality of our decision making and achieve, if not perfection, at least a reasonable chance at true long term success. This post originally ran on February 7, 2009. Thanks very much for re-running this post. I’m off to find a copy of DÃ¶rner. Great post. So, great, I can’t add anything–except to say that if all of this said is true, isn’t the most logical urban reform to limit government powers in urban areas? For example, I have missed many posts, but can’t ever recall the massive eminent domain powers so commonly used being brought up on here. Aaron-good article (although a bit dated by a few comments). One of my few life rules is this-your greatest strength is also your greatest weakness. It depends on the situation. So if you have a certain personality trait, for example, you tend to rely on it. It is successful in some instances, and not in others. Cities are the same. Chicago’s greatest strength is that it’s Chicago-big city, good transit, dense, world-class architecture and culture. But that’s also its weakness-it’s crowded, expensive (realtively speaking to other midwest metros) and a “big ship” to steer. Columbus is the opposite. It’s much less dense, has many fewer cultural opportunities (realtive to Chicago)and bad public transit. But it’s a cheap, easy place to live. The fact that they demolished the downtown mall shows both the strength and weakness-Columbus had land to burn and did so. They annexed outwards and built three new malls in the ‘burbs after they built City Center. This has kept them viable-more tax base, lower costs overall, but has also led to a dilution of the urban core. Chicago doesn’t have that problem. Great article. As we face an urban planning failure here in Ottawa (in the name of the Landsdowne Park re-development proposal), I will be forwarding this to my city council members. Perhaps I should send them a copy of the book…. Sorry Lisa, but chances are few will want to learn this lesson. Power is generally what people in government are seeking. John, power is what people everywhere are seeking. What do you suppose campaign contributions are for, and why more of it goes into the system? Paradoxically, the larger a city’s government is, the more libertarian the society tends to be. The larger a government instution becomes, the slower its movements and actions become. People and businesses just know governments are going to be slow on the uptake, or know they can’t be counted on, and get on with their lives. Yes, and this was the genius of the founders thinking–which was very much based on the knowledge of human weakness/lust for power. The constitution was written to control government power. The lack of self examination and honesty about mistakes is very much tied to the lust for power by most parties. One can see this with the conservative hypocrisy over liberal social engineering/ welfare/education policy while mostly advocating conservative social engineering. Likewise the Liberals have an obvious dislike of ever taking away any government power. A good example of this is their lack of interest in critical examination of “urban renewal” policies and the massive highway building, zoning policies and housing programs that shaped the world we live in. If honest, they should now bitterly try to stop and limit federal and state highway building and many other powers. Obviously, they don’t because critcism of any past government action raises doubts about all government power. Black Swan Event, generically… Columbus, and Fukushima Dai-ich, specifically. The caricature of liberals/progressives as “statists”–people who seek to increase government power for its own sake–is generally flawed. Speaking as a progressive, I have my opinions on what a fair and just society looks like, and will support policies designed to get there. In some cases, that involves state action; in other cases, not. Personally, I’m often skeptical of urban renewal projects given the potential for abuse–there’s a demonstrated history of such being used for unpleasant ends. And I’m all for reducing the amount of highway construction, and some of the more obnoxious uses of zoning (particularly where it’s primary purpose is to exclude the poor). That doesn’t mean I oppose, or ought to oppose, government powers to plan and build infrastructure generally–just particular applications of such. There is lots of damage done over the past century that needs to be undone. Demanding that government surrender its powers now will make it harder to do this work. Well, why exactly do you think, the primary progressive groups are not violently opposed to government highway projects. They are quick to pose as “defenders of the planet”, concerned about peak oil, global warming and the ravages of Walmart. I Know the Sierra Club and other groups do come out against many highway construction projects, but in a pretty tame way. You really don’t see people laying under bulldozers, in the way they seem so eager to do when a project is “corporate”. Honestly, I do find most of this rather far out interest in new “green energy” likely in the near future to make impacts, while leaving the giant issues and costs of highways and density mostly off the table to be strange. To me the only clear explanation is a refusal to ever examine government failure and a desire for power/control and more spending. I may be exagerating-or understating things because as a whole, the level of exploration and study in this area seems slim. How many hearings have there been on this issue? How many on whether Barry Bonds used steroids? Oh and by the way, Progressives are very concerned about abuses like “insider trading” in the corporate world. Did you know members of congress are exempt from these laws? Once again, the standard is clear–government is beyond examination. Government officials can never have corrupt motives. There are many camps of liberals, John, and many groups in the Democratic coalition which aren’t very liberal to begin with. Democratic politicians are often captured by moneyed special interests just like Republican ones are, and the ones which manage to get elected to high office tend to be wealthy. (Charles Schumer is a liberal Democrat, yet its his wife suing to remove the Prospect Park bike lane). If you come out to the West Coast, you’ll occasionally be treated to environmental activists laying in front of bulldozers–though here in Oregon, environmentalists have sufficient political clout that such tactics aren’t always necessary. You seem to be lumping everyone in the broader liberal coalition into the same bucket, and suggesting that because group A may find it convenient to align with group B in some circumstance, A is responsible for all of B’s activities. Most libertarian (and libertarian-leaning Republicans) I know get annoyed when liberals tie them in with the birthers, bombers, and Bible-thumpers that are found within the GOP coalition–likewise on the left. And I’m with you 100% on the need for greater transparency of elected officials, and on my dislike for political grandstanding on issues such as Barry Bonds’ alleged doping. I do not consider government to be “beyond examination” in the least; and there’s plenty of corrupt motives on both sides of the aisle. At any rate, if you think the political left is being insincere in its positions, given that it frequently compromises with the political center to get things done–there’s plenty on the left who will agree with you. Sure, liberals are no longer lying in front of bulldozers. This is because we live in 2011 and not 1968, and the sort of political activism that was acceptable then is just not done now, by anyone. In today’s world of NEPA, if you want to derail a project, you file lawsuits. But in 1968 the liberals did lie in front of bulldozers. The freeway revolts were a politically progressive force – both in that the main players were liberal (Barbara Mikulski begun her political life in a freeway revolt, and Jane Jacobs had leftist sensibilities on issues like race and industrial policy), and in that they were part of a broader protest movement connected to Silent Spring-style environmentalism, second-wave feminism, civil rights, and opposition to the Vietnam War. The language used had enough libertarian overtones that this movement could accommodate Rothbard, but then Rothbard broke with it and started throwing his lot in with racists like Lew Rockwell. The other libertarians weren’t ever part of it – not Ayn Rand or Ludwig von Mises, and certainly not the people who are now bankrolling libertarian foundations. On the contrary, Olin started his foundation in response to a student riot. I really think the real hypocrisy here isn’t in the center but at the far left–particularly the environmental left. The centrists are well–in the middle and therefore are open defenders of whatever exists now; that they are against big changes is not hypocrisy. It’s the far environmental left that is quite bogus. We just saw, perhaps 400 thousand people in England protest budget cuts. When, collective bargaining was challenged–a state capital was physically occupied. How many massive “green” mass marches have we seen against nuclear power? Literally hundreds. Green Peace has engaged in all kinds of extremely dangerous committed antics to stop logging or block whaling boats. Groups have bombed companies doing animal testing or burned down sprawl housing developments. In light of this long record of very intense committed opposition and advocacy for the environment–the lack of strong opposition to government policies speaks volumes. Many, like me suspect that today’s green movement has much more to do with hatred of capitalism and power lust than sincere interest in the Earth. Well, yes some people did strongly resist the destruction of their own neighborhoods. All, in all it was rather tame. I mean, considering there are life long activists who will travel the earth to protest stuff–we haven’t seen many travel to protest rural road construction. They protest sprawl development and Walmart-but not the government funded highway that makes them possible. John, I’m not sure what you are trying to argue here. The western environmental movement (in its many flavors) is generally a distinct movement from international Marxism–you seem to be suggesting that greens in the US have something to apologize for in regard to the well-documented environmental depredations of the Soviets and their client states. The two groups have little to do with each other. Certainly, there are probably have been (and are) Marxists among US environmentalists, and there’s some ideological overlap where corporations are concerned, but mainstream environmentalist organizations are not Marxist in nature. And yes, there are extremists. I guarantee you, the terrorists on the right have caused far more damage and death than Greenpeace, ELF, ALF, etc.–next to al Qaeda, the terrorist organization that has killed the most Americans is the KKK. Should mainstream conservatives be held to account for the lynch mobs and church-bombers which were commonplace a century after the Civil War? I have no sympathy whatsoever for the Soviets, or the Maoists–any moreso than I have for the Nazis. My agenda is entirely contained within the framework of western democracy, and is capitalist to boot (though I favor state intervention and regulation of many issues, I am not a Marxist). Likewise for most other US urbanists and transit advocates. The dead dictators who you so gleefully flog have utterly nothing to do with the present political debate in 21st century America. John, the term “far environmental left” is an oxymoron. There’s a mainstream environmental movement that is politically on the left. These are organizations that affect environmental change through the system — lobbying, lawsuits, formal organizations and even political parties (Greens). These are groups like the Sierra Club, League of Conservation Voters, the NRDC and the like. Then there are the more radical elements such as ELF and ALF. It’s hard to characterize their politics on a spectrum of left/right. The groups exist outside of politics, have a disdain for politics, and are more motivated by direct action. There’s also a preference for guerrilla tactics — where the goal is to weaken and destabilize the opposition rather than to replace the opposition and capture or replace their apparatus. Pinning down these groups’ politics is difficult. Economically, they have leftist or anarchist sympathies. However, radical environmentalists exhibit attitudes on environmental matters that are reactionary or fundamentalist, traits generally considered right-wing. Yes, but when almost all of the “direct actions” target corporations and almost never government entities (other than the defence department), they are exposing a pretty strong political view. ELF frequently damages US Forest Service property; ALF has broken into and destroyed numerous research labs found at public universities. In general, neither cares on whit about who their opponents are, nor has any sort of reverence for the government. The “government vs private sector” framing of matters is simply not as important to the rest of us as it is to Libertarians. Um, those were Democrats! Remember the solid Democratic South. BTW, a Former high Klan Official is now running for mayor of a town as a Democrat in Florida. Clearly, there’s more than enough history and blame to go around. No, but they do have a responsibility to examine the long history of environmental destruction and waste in planned economies as long as they advocate increased government planning here. How much press was there for the TVA coal ash disaster? We can mince words or come up with small exceptions, but as whole most of these groups have been far more critical of the private than public sector. The term “corporate and polluter” are almost always used together. The relative silence about government screw ups is pretty obvious. Federal and state road construction and Federal mortgage and loan polities are two of the largest factors in sprawl, oil dependence and all the other issues these groups profess concern for. I’m more interested in the question as far as ideologies and ideological coalitions are concerned. The Democrats have existed (in some form) since the dawn of the Republic, and have over their two centuries of history, ran the gamut of the ideological spectrum. And yes, there’s a few reactionary politicians running as Democrats in the south; and Lyndon LaRouche likes to run as a Democrat (though he’s persona non grata within the party). Regarding environmentalists and “planned economies”–the sort of planning advocated by western environmentalists has little to do with the command economy of the Soviet Union, one which had little regard for environmental outcomes. Regarding the TVA coal ash disaster, the environmental community went ballistic against the TVA for that. Numerous lawsuits were filed, Greenpeace and other groups called for indictments against the officials responsible–I can’t think of anyone in the environmental movement who downplayed the seriousness of what occurred because the government rather than private industry was the polluter. Virtually all serious environmentalists are such for the sake of the environment; not because they view it as a wedge issue by which to pursue an anti-corporate agenda or expand state power for its own sake. (In a similar fashion, those opposed to the environmentalist agenda don’t do so out of a desire to despoil the earth; but do so because they view the environmental program as damaging to commerce, or an infringement on liberty). Your claim of “relative silence about government screwups” is FTMP a myth. If environmentalists are harder in balance on the private sector–perhaps the private sector pollutes more? And, if I’ve failed to point it out before, I’ll point it out again. Many environmentalists and urbanists OPPOSE the neverending stream of asphalt that state and federal DOTs like to build, and also question things like the mortgage interest deduction and other subsidies of homeownership. Elected officials (including Democrats) frequently like these things, as they are politically popular, but that doesn’t mean that the various interest groups in the Democratic coalition go along. Again, come out to Oregon, and you’ll see this dynamic close up–the Democrats who wield power in Salem are generally disliked by the state’s environmental activists; although the state GOP still is far worse. Relative to what seems to have happened and the level of damage–the TVA disaster is an obscure event. If these people were serious–it would have gone long beyond dislike-years ago. Yes there is some opposition but it really seems tame. State DOT depts, Federal Highway administrators, zoning boards and government housing policy are at the very core of what these people opposed to. Examination of screw ups is most certainly not a myth. We to this day have had a massive credit and housing bubble and no real examination of either the Federal Reserve; Fannie Mae/Freddie Mac or the banks. Court orders have been required to get minimal information from the Fed and regulating agencies–even as more piles of regulations are piled on. The message is clear–any attempt to examine the government’s own role in a problem is off limits. The solution to every problem is more government power. The whole history of urban renewal and the millions of lives it affected is a black hole with very little written about it. Jane Jacobs is very much the exception to the rule–someone who did consistently question large scale uses of power. She also at various times said she understood and was sympathetic to the views of Libertarians. John, Jacobs over time developed a general disdain for planning as an institution — including toward the very people joining the profession to create the very communities she chronicled. John wrote: If these people were serious—it would have gone long beyond dislike-years ago. Yes there is some opposition but it really seems tame. This goes back to the difference between mainstream vs. radical environmentalism. The beyond-dislike doesn’t manifest itself as a viable opposition that shakes the establishment cage. For one thing, radicals by temperament don’t have the discipline or the motivation to use political means to achieve their ends. Why would an ELFer want to be elected to office on a promise that he/she would banish logging companies and return forests to wilderness, when they could just confront their antagonists directly and achieve the same goals through frustration? Second, the radical doesn’t want to battle the mainstream in the arena where the mainstream will win. The mainstream is a known quantity and is better suited to form a coalition with the interests who have a greater deal to lose if the radical were elected. I have not read everything Jacobs wrote, just Death and Life, many times; Dark Age Ahead and a number of interviews.I also saw her speak once. I actually found her positions to be quite consistent and coherent over time and fall closest to the Libertarian camp. Jacobs opinions are IMHO, what would expect from a smart, observant, caring person who lived through the 20th century. Jacobs had some left-libertarian sympathies, especially with planning. She never had any on economics – she said nasty things about the New Deal, but her understanding of economics is still very Keynesian, and while Hayek et al were busy cheerleading Pinochet, Cities and the Wealth of Nations explained exactly why his policies were a failure. On the level of community, she was consistently hostile to big business, and her cultural understanding of cities was much more egalitarian than individualistic. But you don’t even need to read Cities and the Wealth of Nations to see this. Just look at which politicians she collaborated with. Libertarians almost invariably choose to work with more conservative politicians. Jacobs worked with David Miller. Terms like Conservative are mostly useless and misleading. From what I could see on the Wikipedia entry on Miller, his positions would be things a number of consistant Libertarians could or should support. Opposing a big boondogle bridge project that might cut off waterfront property from development and raising the idea of tolling formerly “free” roads are both consistant with Libertarian thinking. I somehow seriously doubt any real Libertarian candidate was running for Mayor of Toronto. Also, late in Jane’s life she made comments in places like Reason magazine showing strong support for privately operated transit systems like Hong Kong’s. For the record, the idea’s of so called Libertarians defending the government entitlement to free highways, are beyond bizarre and I have pretty much tried to ignore them. I am certainly not saying that hypocricy belongs just to the left. Miller is a member of the Liberal party. He did not get the support of any of the libertarian-ish organizations in Canada, which are reliably Conservative. His tenure as mayor was marked by standard liberal policies on the public sector’s role and immigration; tellingly, all you’re saying is that he wasn’t pro-highway, which is consistent with what modern urbanist progressives think about government’s role. Jacobs made a lot of comments in her later life that could be construed as libertarian. She also made a lot of un-libertarian comments about how it’s important to preserve old buildings from destruction (forget Reason for a second – even Market Urbanism disagrees), and how the reason for Houston’s urban form is developer inertia. What this has to do with hypocrisy is beyond me. You can define every person who’s not a road socialist as a libertarian, and then conclude liberals are road socialists, or you can actually look at the policies those people promoted outside of urbanism. Obviously, the highway-urban destruction issue would have been one of the single biggest for Jacobs. As to urbanist progressives attitudes towards highways–particularly free highways, it seems pretty mixed. All logic should indicate, almost absolute violent opposition but one really sees something pretty lukewarm. One reason for this of course is that almost all people have adjusted their lives and expectations around these roads. However, given the environmental and social effects (the area liberals claim to care so much about) the hatred should be much stronger. In the end one has to guess that the idea of people paying market prices for goods is more than they can stomach. In the end control is what it’s about. The hatred really is much stronger. Miller doesn’t think people should pay for health care, education, or other social services – just for roads. And New York’s urban liberal thinktank, the DMI, was a huge supporter of congestion pricing. Even the anti-pricing liberals say nothing about public ownership and control. They say that the government shouldn’t charge the working class for public services. Please give an example of one mass protest or attempt at mass protest for congestion pricing or one Protest serious mass protest against rural and exurban road funding. We all know such things are pretty common if people really care about things. A position paper or two is hardly a strong effort. In PA we pretty clearly had a situation in which it was either Toll route 80 or cut funds for transit. Few really went to the wall to toll route 80. It gets far worse to anyone who looks. How many so called “black studies” programs are there raking over often ancient history? Yet, when it comes to eminent domain and The Hill district it’s a black hole. Not only has the very recent history of the Hill’s destruction not been examined, but the bulk of Democrats in the city and city leaders conspired again to tear down another chunk of the Lower Hill to build a new Hockey area. Terms of construction were supposed to obey a “community benefits agreement”, which mandated taking down the Mellon Arena try to repair the street grid (not really possible due to a highway)and build mixed used development. Now in spite of signing this agreement, a large number of powerful people(almost all calling themselves liberals) are trying to keep the old Mellon Arena in place. Honestly, I felt like I wanted to join and say something but have felt very alone. I’m somewhat of an outsider, but it seems shocking to me how few people know or care about The Hill District’s history. Liberals are supposed to care about these things. I don’t see that at all. One can find example after example of this kind of behavior, often in minority communities. I think The story with Yankee Stadium/New Yankee Stadium and the South Bronx is similar.